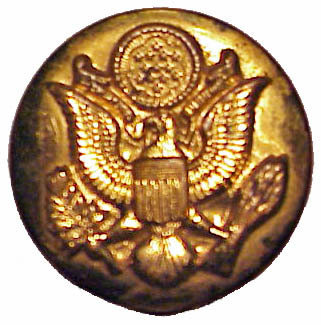 The following is a brief introduction to U.S. Army enlisted men's collar disks. The illustrations are examples and I am not showing all of the varieties that exist of each type. 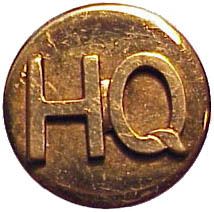 The type classification is one by formulated collectors and not by the U.S. Army. Categorizing early disks into a Type I and a Type II was originally the idea of Charles A. Edwards and the classification was extended and codified by James McDuff. Although, I do not find this classification system totally satisfactory, it is understood by collectors and therefore I will use it. When I call a disk a one-piece or two-piece only the front of the disk is considered and not the various attaching parts on the back of the insignia. 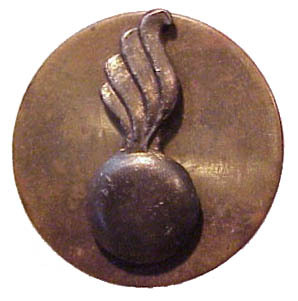 For those who find that odd, I am only following established terminology that insignia collectors use. The problem with counting attaching parts is that some are permanently fixed to the back of the insignia. So, are the parts that are not removable counted or not? 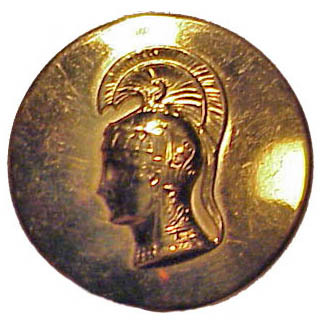 The classification system is focused on the front of the insignia and does not fully consider the all features of manufacture style and of dating issues. The various dates of use I list are my approximations and subject to error. Items were often continued in use as long as serviceable even if a newer style had been introduced. 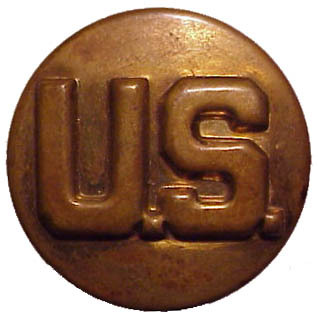 Collar disks similar in style to those of the U.S. Army were also used by the U.S. Marine Corps, U.S. Forest Service, the Civilian Conservation Corps and others. On October 8, 1907 the War Department issued Circular No. 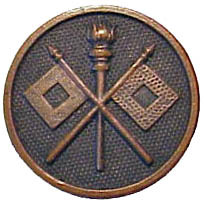 68 that described new insignia to be worn on the standing collars of enlisted men's service uniforms. These were to have been two pairs of one inch bronze disks. On each side of the collar there was a pair, one bearing the letters U.S. and the other the branch of service. 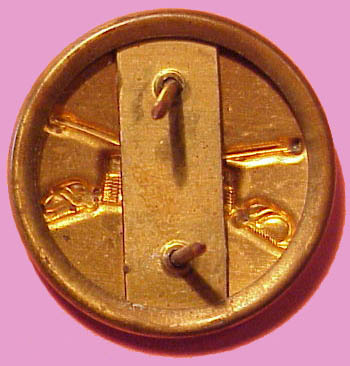 The insignia were attached by a threaded post and thumb screw nut. 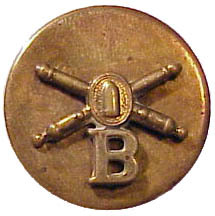 Older enlisted insignia that were in use were cut out emblems of the service branch similar to officer's collar insignia. The edges of the cut out insignia snagged on brush and the insignia came loose. The pins frequently broke on these and it was hoped that these new disks would be nearly indestructible. A second circular No. 78 of November 17, 1909 delayed the implementation to July 1, 1910. 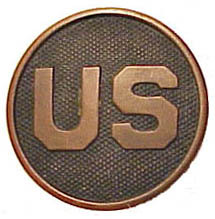 Not long afterward the decision was made that each soldier would wear a total of two disks rather than four with the right one being the U.S. and the left one being the branch. Certain of the disks included the regiment number and company letter on the face. The earliest of these disks are referred to as Type I disks. 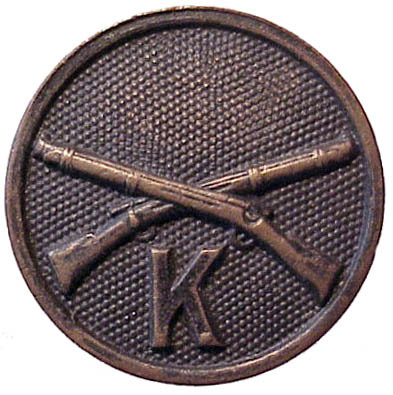 This type was in use from 1910-1924 and was the type used during the First World War. They have a background pattern that was plain or may be dots, cross-hatches, diamonds, etc. but these were manufacture variations and have no major significance. 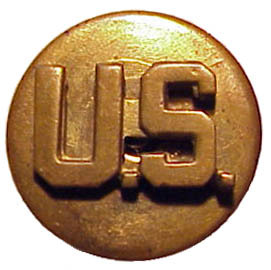 The plain block US was the original and basic right sided collar insignia. 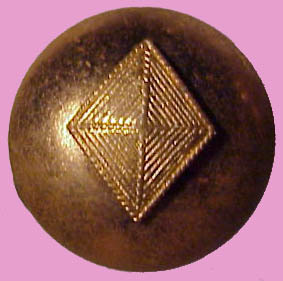 It was used by the Regular Army during the entire period. 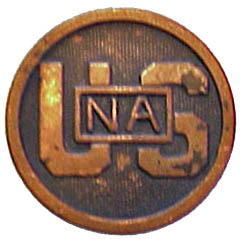 In August 1917 monogram disks with the letters USNG (United States National Guard) and USNA (United States National Army) were approved. 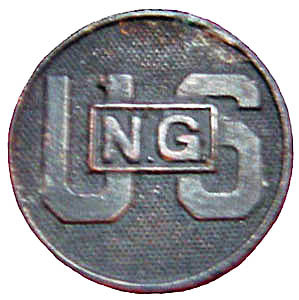 The USNG were federalized National Guard units and the USNA were units comprised of drafted soldiers. 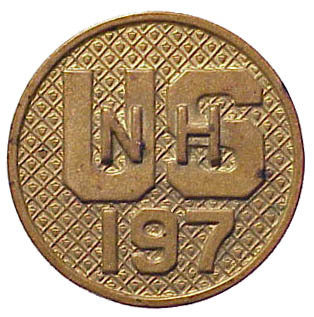 In December 1917 it was decided to replace the monogram style with ones showing small block letters NA or NG on a rectangular frame set on the US. 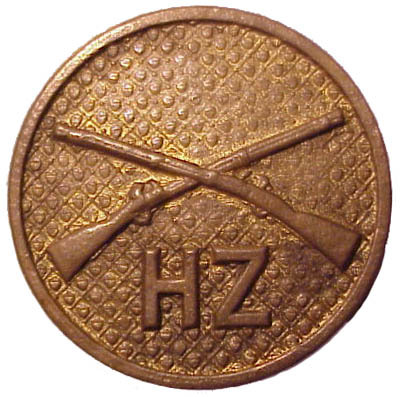 These were more similar to officer's insignia, easier to read, and allowed a number to be placed on the disk. For example we have number 345 on our one example. 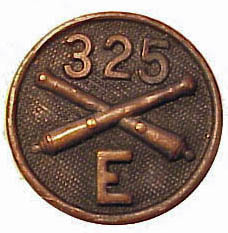 This might have been the 345th Infantry Regiment if worn with an infantry disk on the opposite collar or it might have been the 345th Field Artillery Regiment if paired with an artillery disk. 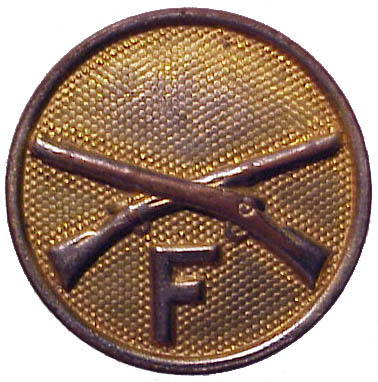 The infantry disk might have the company letter below the branch device. 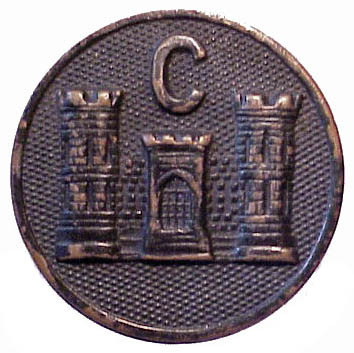 In that way an observer looking at the pair would know from the right the regiment number and the left the company letter. 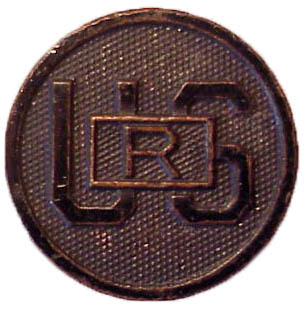 Disks also exist for the Army Reserve Corps featuring the letter R, either as a series USR in block or script with a larger central letter or as an R superimposed on the US as in the example shown. 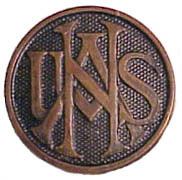 Another distinction was the letter V for volunteers, which can be found in similar styles. 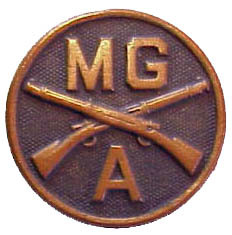 In time the distinction between the Regular Army, the federalized National Guard and the National Army proved to be divisive and was dropped. The 12 disks shown above are but a small sample of the various branches and variations that existed. 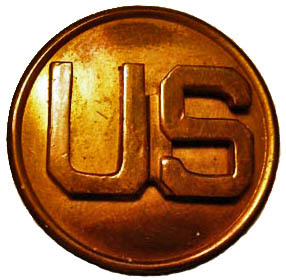 In 1917 the problem of supplying certain branches with left-sided disks having both regimental and company designations was solved by placing the regimental number on the right-sided U.S. disk and having the company letter on the left-sided branch disk. 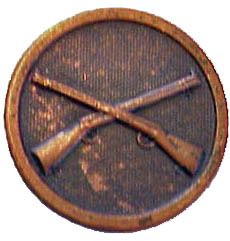 That way the same disk could be issued to all the Company A soldier in each regiment and the same numbered U.S. might be used by soldiers in different branches whose units had the same number. 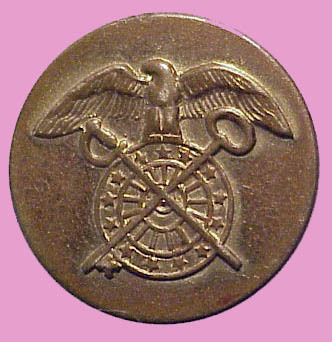 Many branches did not try to display unit designations on disks at all; for example, ordnance, medical or quartermaster. Surviving uniforms and photographs suggests that the soldiers in practice were often wearing obsolete insignia and the obvious results of all these changes was a lot of chaos. 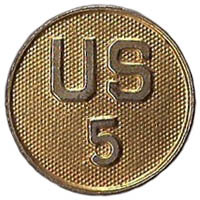 The original concept of the bronze collar disks was that they would be worn on the service uniform as distinct from the blue dress uniform. 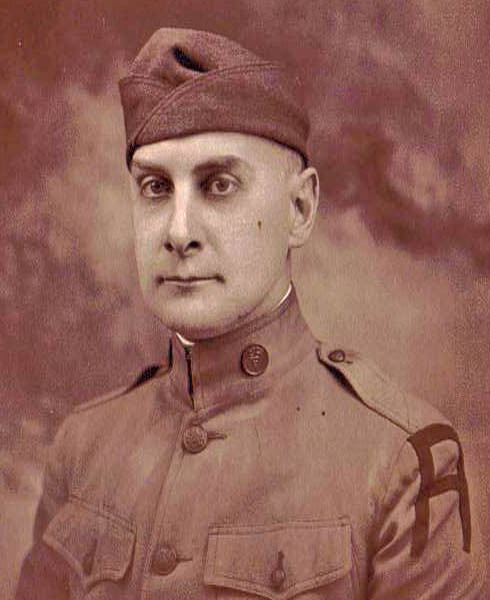 In 1917 with the nation at war the dress uniform and its insignia was suspended. It was to be an olive drab and khaki war. 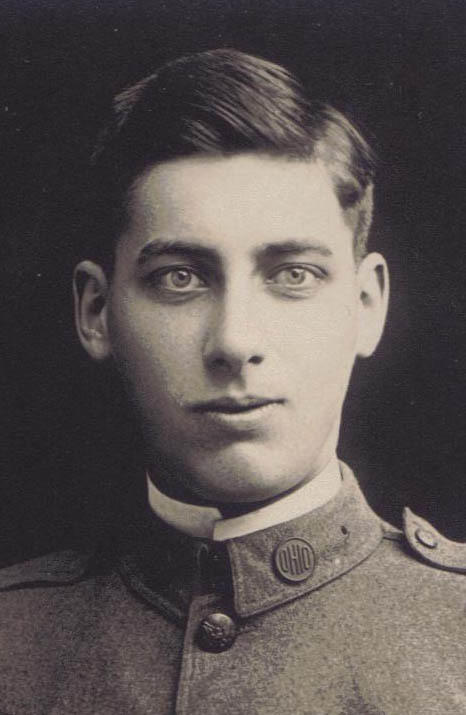 Once the war ended the dress blue uniform was not restored for general use but for many the service uniform was too drab. 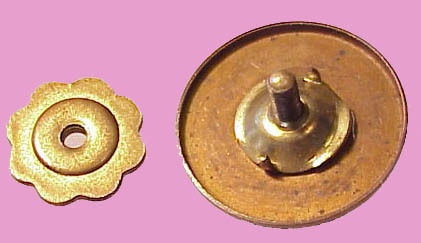 The solution was to use gilt collar disks rather than bronze ones. Previously, gilt disks had been approved in situations were troops were wearing white dress uniforms and certain other situations. 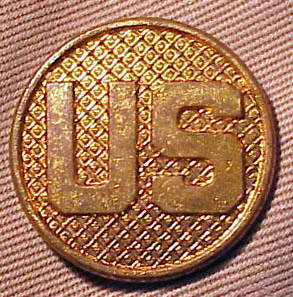 Army Regulations AR 600-35 of October 14, 1921 stated that collar disks might be bronze on service uniforms and gilt on white uniforms. 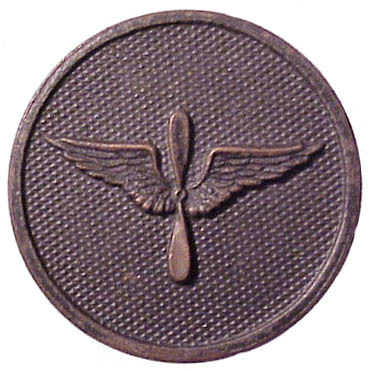 On November 25, 1924 the bronze disks were dropped for peace time use on all uniforms. Those still in service were to have been polished to a bright finish. The distinction between Type I and Type II disks is minor and is one made by collectors rather than the military. 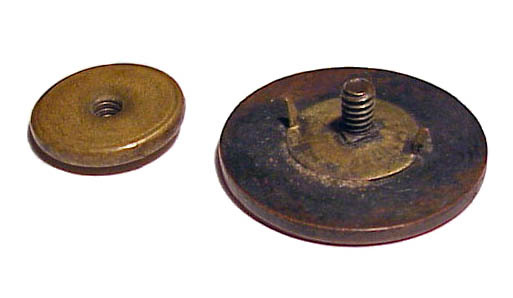 Type I and Type II disks continued in use until the advent of the Type III disk and likely were issued until stocks of them were exhausted after 1937, which was the usual practice by the Army. 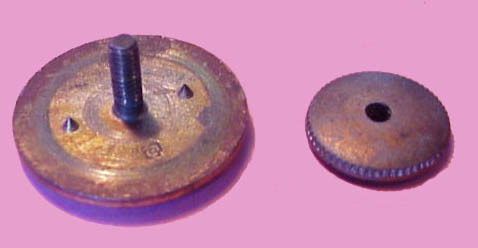 Type II disks were also one piece screw post disks but have a more intricate background pattern than the Type I disk. The pattern consists of a series of diagonal cross hatched lines with a pattern of shields or acorns in the squares formed by the lines. This background pattern was established as the sole official one by Army Regulations AR 600-35 of December 31, 1926 but existed as a manufacturers variation prior to that time. Prior to 1926 at least six different different background types were in use and Type II background appear on disks dated to 1919 according to Albert Scipio. The regulations issued on December 31, 1926 also abolished the standing collar and introduced a label, rolled collar coat. 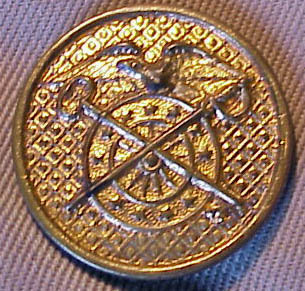 The collar disks were then worn on the upper collar of the coat's lapels. 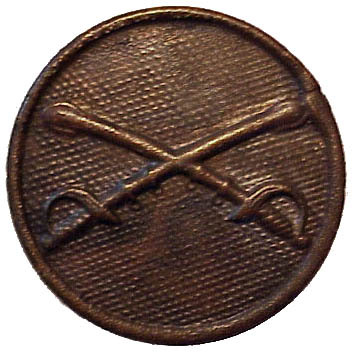 There are also a few disks with a Type II background produced that were two piece with a branch device that could be removed for cleaning similar to the Type III disks that would follow. 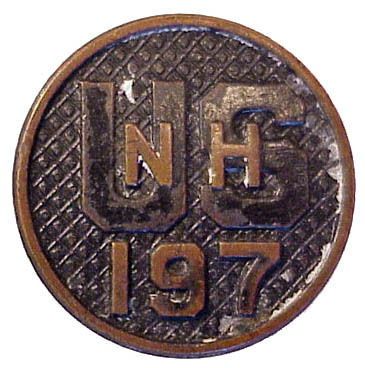 The above disk is a right sided one for the 197th Artillery Regiment (Coast Artillery Corps) of the New Hampshire National Guard. 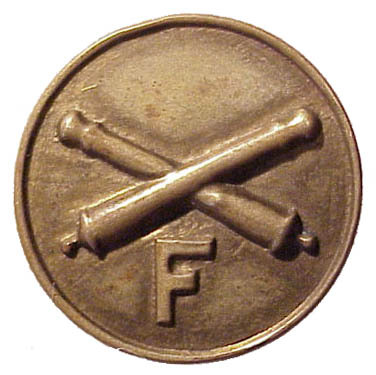 In 1937 the Army adopted a new type of disk that differed from the Type I and II in that the disk was two piece. 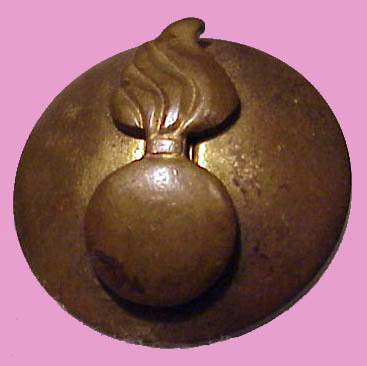 It had a plain blight brass finish with a small square hole in the center. 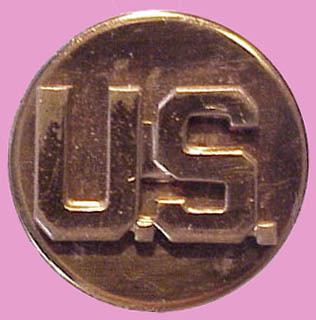 The device of the service branch or the letters U.S. were a separate piece that had the screw post in its back and fit into the hole in the disk. 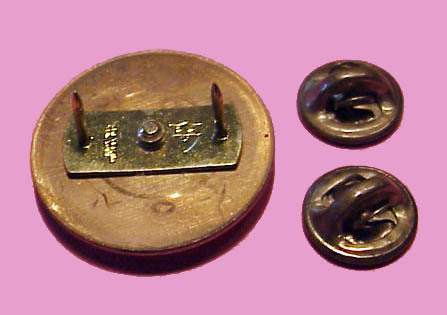 A separate piece screwed on the back held the disk and branch device together and the entire assembly was attached to the uniform with a screw nut. 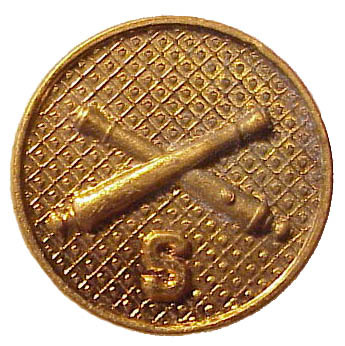 Type III disks were mass produced in the early years of World War Two and are common on period uniforms. 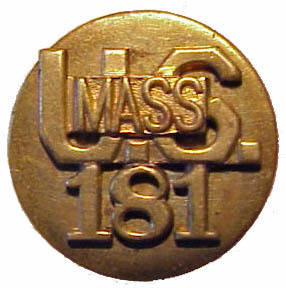 Their production was discontinued during the war because they used a fair amount of brass, which was a strategic material. William K. Emerson called type of Type III disk adopted in 1937 a Type IIIa to distinguish it from the more recent two piece disk that I call a "Neo-Type III" and he calls a Type IIIc. This style disk appears not to have been assigned a typological classification. 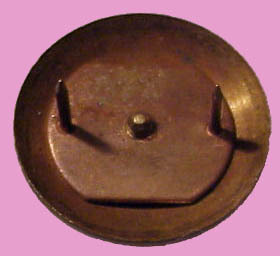 It has narrow but deep border and is a slightly domed two-piece disk attached by a screw post. 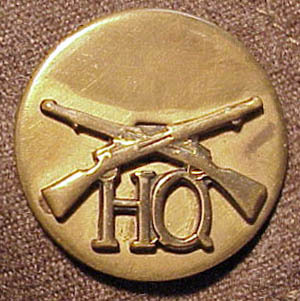 The pair were removed from a pre-WWII mothed out uniform. This style disk appears not to have been assigned a typological classification. 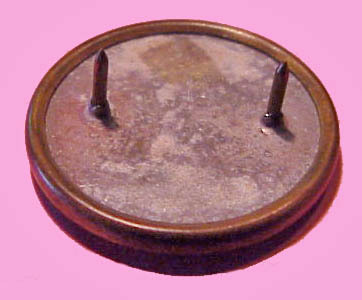 It is a thick, one piece disk attached by a screw post and marked with the letters PC intertwined. This style disk also appears not to have been assigned a typological classification. It is a thin, two piece disk attached by a screw post. There is an outer edge that is "cookie cutter" like. This was removed from a relative's uniform who was discharged in 1945. It is very similar to the previous one but features an outer edge which is rolled. 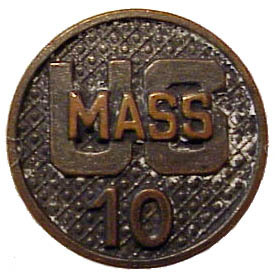 These unclassified disks almost appear to be "missing links" between the more common Type III and Type IV manufacture styles. It is possible also they are of foreign manufacture. This style disk also appears not to have been assigned a typological classification. 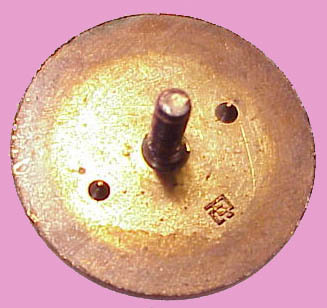 It is a one piece disk attached by a screw post. 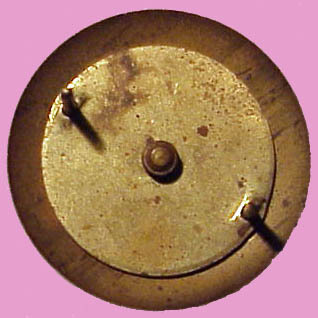 The parachute and infantry devices are brazed on the disk's surface. This is not a true two piece disk and it cannot be dissembled. 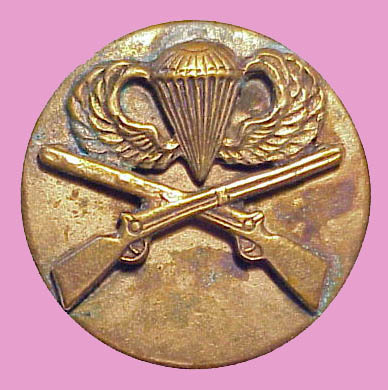 It is not a regulation insignia and most parachute infantrymen wore regular infantry branch insignia. There are two pointed projections from the back that kept the insignia from spinning. 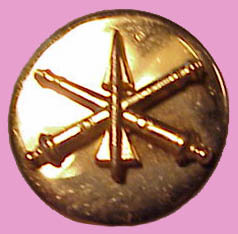 Other styles of privately purchased parachute infantry disks are known but most have the parachute insignia below the crossed rifles and have one of the more usual manufacture styles. I am uncertain what other branch collar disks Ludlow may have made. Albert Scipio defines the Type IV disk as an uncommon type thick one piece disk attached by clutches rather than screw posts. 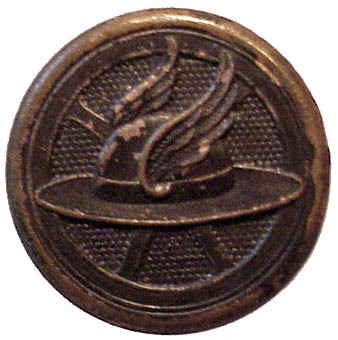 William K. Emerson mentions that ROTC torch disks and certain postwar German manufactured disks are of this type. I do not seem to have any examples. 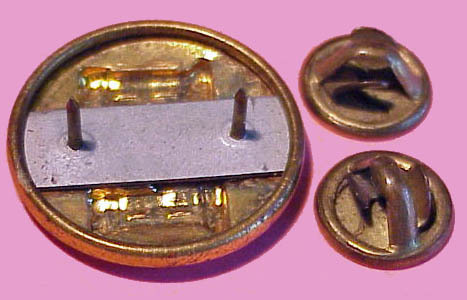 Type III disks used too much brass and because of the need to conserve strategic material the manufacture of two piece post and screw disks was discontinued and a new type of disk, the Type V, was introduced. 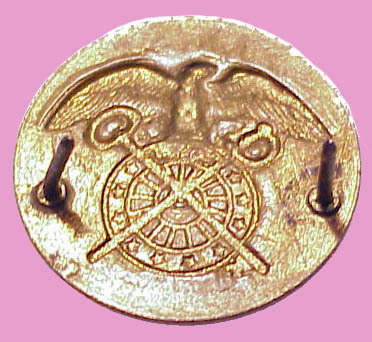 These were one piece of thin stamped brass that were attached using Ballou clutches and two pointed posts mounted on the back of the disk. The clutch was invented by Frederick Ballou and Melvin Moore. The B. A. Ballou Company of East Providence, Rhode Island began producing clutches in 1942 and received its first patent on them in 1943. Other clutch types had been used on some private purchased insignia since the 1920s, however, this was the first time clutches were used in mass quantities. Ballou clutches used during the Second World War are marked "Patent Pending" or "PAT NOS' 2308412 -- 2308424." 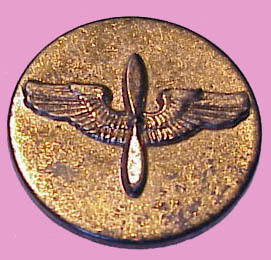 A second, less common clutch type found on some insignia are Tinnerman clutches. These were invented by Albert H. Tinnerman (1879-1961), whose company made all kinds of spring steel fasteners for industrial applications. 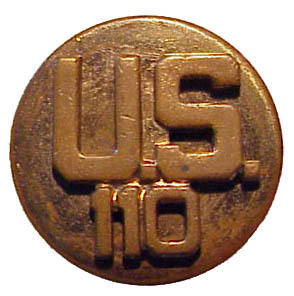 Since the U.S. or branch design was stamped on the front of the insignia you do not see the variety of that existed with type III disks. The various additional unit designation letters and numbers do not appear on type V disks. This was removed from a relative's uniform who was discharged in 1945. The clutch posts are supported by a steel or zinc insert in the back of the insignia. 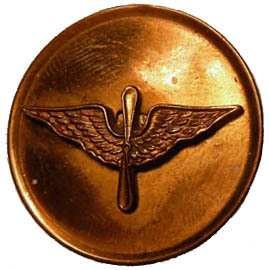 This is a second type of Type V disk that is World War Two era, having a circular metal insert that occupies the entire back of the insignia. Once World War Two was over there was no longer a critical need to conserve brass. 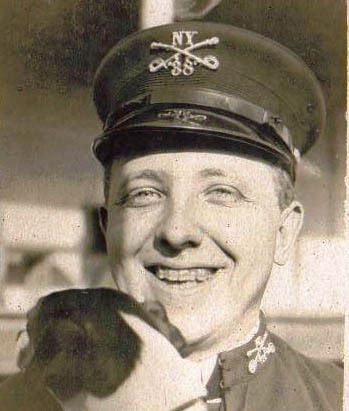 There was also a large stock of unissued collar insignia. Critical to our understanding of the evolution of manufacture styles are those new branch designs that did not exist during the Second World War and thus needed to be newly manufactured. William K. Emerson mentions that beginning in 1951 many collar disks are manufactured with a slight convexity. 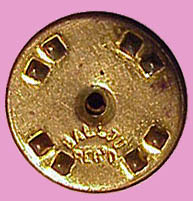 In 1948 the Ballou Company patented an improved clutch with eight small cleats to better hold the material. Clutches have their limitations as dating tools. 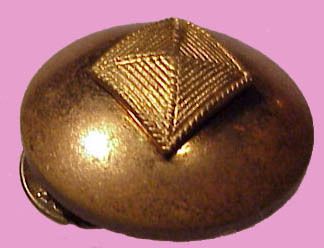 Collectors or others often remove clutches and then replace them with others not appropriate to the date of the insignia. 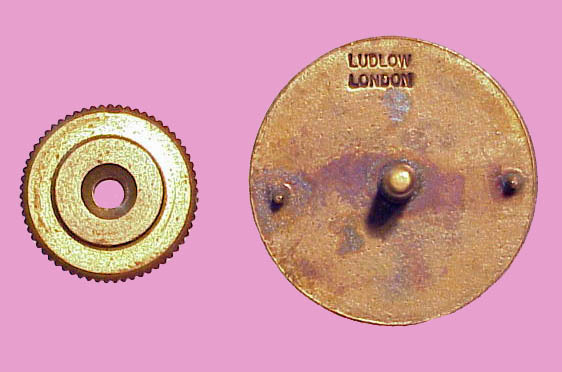 The earliest deviation from the World War Two manufacture style appears to be the use of brass rather than steel in the insert supporting the clutch posts. 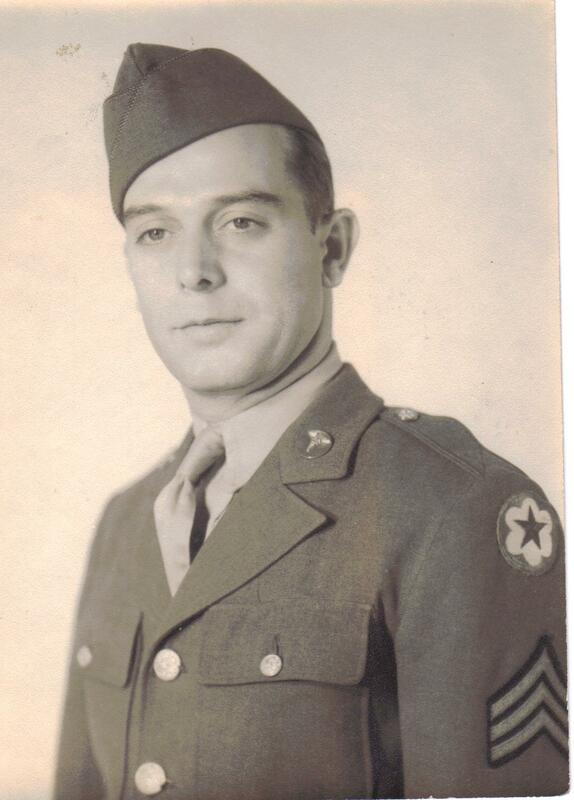 It is possible that some of these date toward the end of the war as brass was removed from the strategic material list but I have not yet discovered one on an unimpeachable World War Two veteran's uniform. 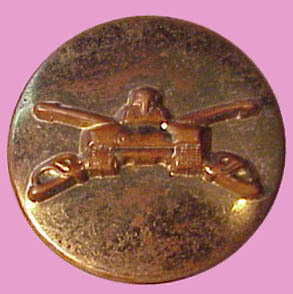 As an example of this construction I show an armored cavalry disk. In 1951 armored and cavalry units were combined into one branch and a new disk introduced with an M26 tank superimposed over crossed sabers. 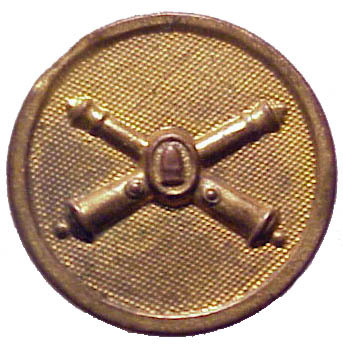 Our example of one of these disks is very similar to the World War Two Corps of Engineers disk removed from the uniform and illustrated above but uses brass rather than steel or zinc. 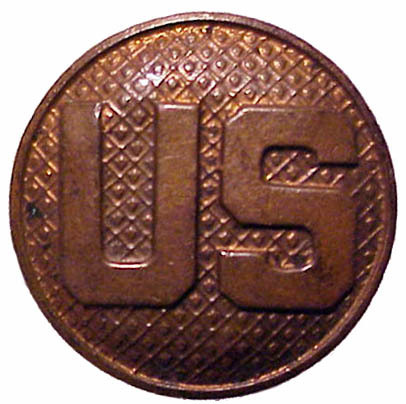 During the postwar period a new type of two piece disk was introduced that was very similar to the pre-World War Two Type III disk. Collectors also call this a type III disk but I will call it a "Neo-Type III" since I believe classifications should be progressive and these disks are distinct from the prewar Type III. 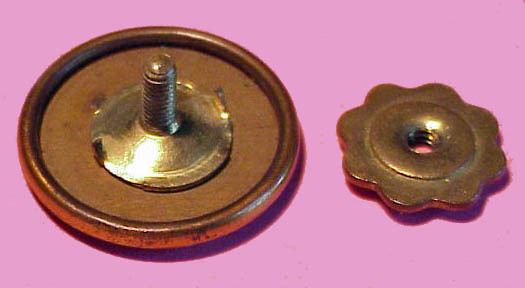 The prewar Type III disks are post and screw with a retaining nut while the postwar "Neo-Type III" disks are clutch back. 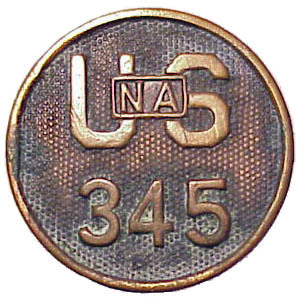 The screw in the "Neo-Type III" disks holds the U.S. or branch device to a brass plate in the back that supports the clutch posts. The design allows the insignia to be disassembled for cleaning and once again allows the use of optional unit designators. As an example I am illustrating an Air Defense Artillery collar disk. 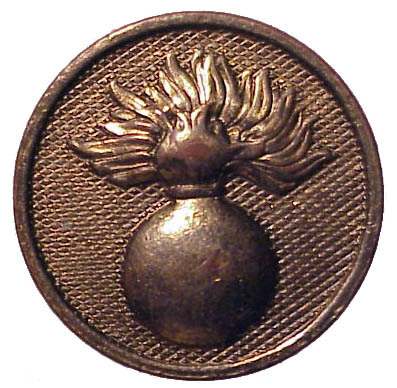 In 1957 the design of artillery branch insignia was changed to incorporate a missile. 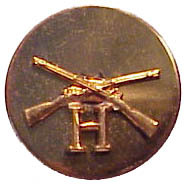 In 1968 this insignia was reserved for Air Defense Artillery only and field artillery units once again wore crossed cannons. James McDuff's original classification used the terms Type III-A for screwback and Type III-B for clutch back and assumed that III-A disks evolved into III-B ones. I believe rather that the Type V were sandwiched in between and that there was a short break of several years during which no Type III-A disks were manufactured. 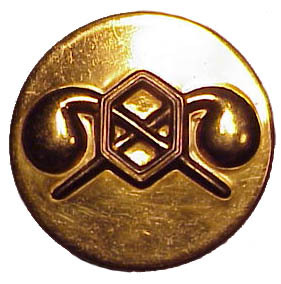 The "Neo-Type III" were in use as a private purchase insignia but in 1970 were adopted as the official issued pattern and Type V disks were discontinued. There are a large number of different shapes to the post support plate. I will not try to illustrate all of them. The clutch post support of the disk illustrated is marked N. S. Meyer, Inc M-22 (in shield) and is believed to date approximately 1965-1975 period. 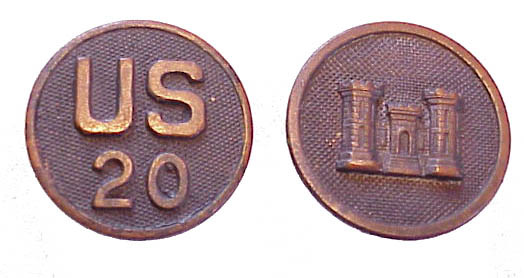 The "M-22" is a alpha-numeric manufacturer's hallmark code for the N. S. Meyer's Company. 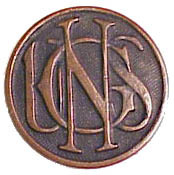 These first appeared on insignia during the 1960s. I am calling this a variation of "Neo-Type III" only because it uses clutches. 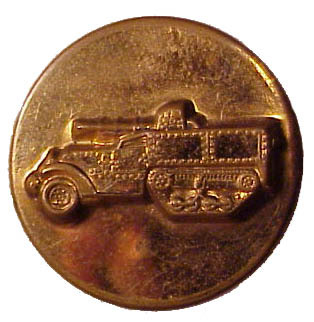 It is of a one piece, die struck construction, leaving a reversed image on the back. There are two rather long pointed posts set in the back similar to the manner in which clutch backed wing badges or rank insignia are made. 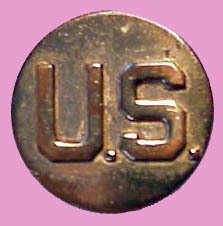 One distinctive variety of post-World War Two collar disk is the domed type. 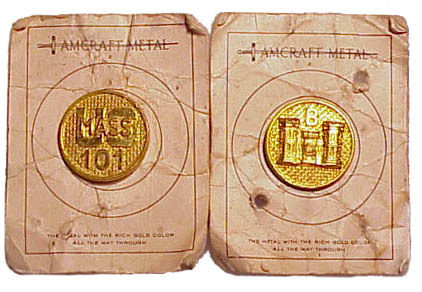 These are two piece disks which were manufactured with a domed surface rather than a flat one and were available as an optional private purchase insignia. In 1952 members of the infantry branch were given the additional distinction of an additional blue plastic frame accenting the collar disk. I would like to thank Don Wagner for his assistance with this page. Du Bois, Arthur, "The Traditions and Glamour of Insignia", The National Geographic Magazine LXXXIII, June 1943: 652-709. 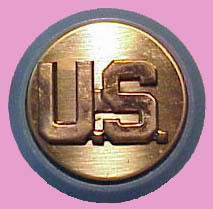 Emerson, William K., Encyclopedia of United States Army Insignia and Uniforms, Norman, OK: University of Oklahoma Press, 1996. Emerson, William K., Tid Bits, The Trading Post, LXII No. 1, January-March 2003. Emerson, William K., Tid Bits: Enlisted Disks, The Trading Post, LLV No. 4, October-December 1996. Grosvenor, Gilbert et al., Insignia and Decorations of the U.S. Armed Forces, Washington: National Geographic Society, 1944. 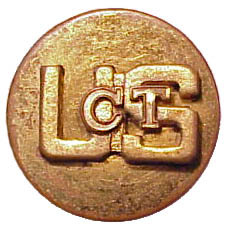 Laframboise, Leon W., History of the Administrative and Technical Services Branch of Service Insignia, El Paso: (Privately Printed), 1968. 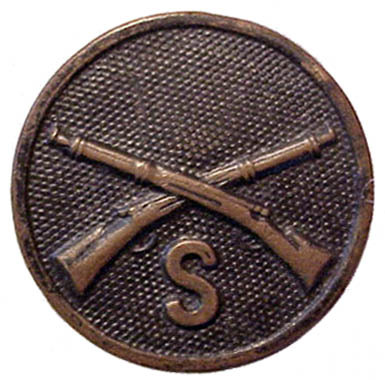 Laframboise, Leon W., History of the Artillery, Cavalry and Infantry Branch of Service Insignia, Steelville, MO: Watson Publishing, 1976. 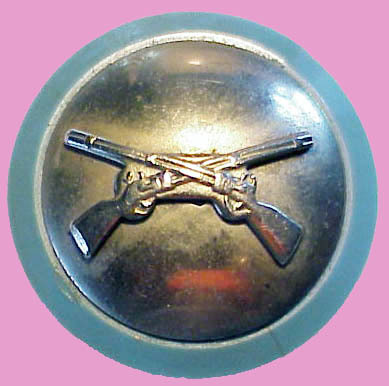 Laframboise, Leon W., History of the Combat Support Branches Branch of Service Insignia, Steelville, MO: Watson Publishing, 1977. Lanham, Howard G., "Method for Approximating Date of Metallic Insignia", The Trading Post, July-September 1970: 74. 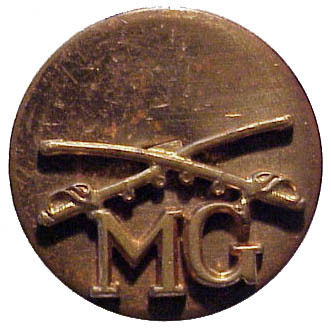 McDuff, James M., U.S. Army Enlisted Men's Collar Insignia 1907-1972, Manchester, MO: (Privately Printed), 1972. Scipio, L. Albert II The Collar Disk Story (1907-1999), Silver Spring, MD: (Privately Printed), 1999. War Department, Army Regulations No. 600-35: Prescribed Service Uniform, Washington, DC: Government Printing Office, 1941. War Department, Army Regulations No. 600-35: Prescribed Service Uniform, Washington, DC: Government Printing Office, 1944. 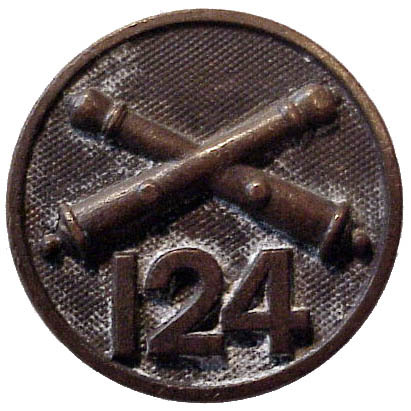 Back Dating Various Categories of Insignia to period of use.